Regardless of the fact he lost his last two matches to John Cena, Kevin Owens will never be as hot as he is right now in the WWE. That might be a curse that haunts the former NXT champion. After going the distance with the United States Champion, where Owens proved to be every bit Cena’s equal, if not his superior, losing the final match – and a chance at a title – in the third and decisive match – might be Owens’ undoing. The WWE does not have a solid track record of taking talent that is ultra-popular and cashing in on a golden opportunity. At least where Cena is concerned. Could this be a change in the game plan for the company? Will writers and management take what they have in Owens, who could be the next great heel, and book him in another program with a solid veteran? 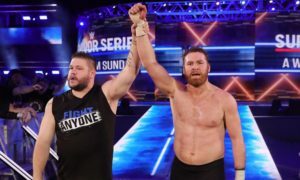 If the company can get away from the idea that Randy Orton and Sheamus presents a great angle for the fans, I think the Apex Predator and Owens would be a great feud – one where the 12-time world champion could help Owens get over again as the future of the company. How the WWE handles the aftermath of Owens and Cena was not the only thing that caught my eye from the Battleground pay-per-view. Here are a few more thoughts. Maybe the best part of Monday night, in my opinion, was the true birth of a new Divas division in the WWE. Finally, we will all want to watch segments with women in the ring rather than take a bathroom break or raid the refrigerator. The fact the WWE is ushering in another Flair era makes this transition all the more exciting. When I was younger, I always thought it would be Reid Flair who would eventually step in and try to challenge his father, Ric, for the family name. No one is ever going to replace the 16-time world champion, but now a new generation can get behind the beautiful and athletically gifted diva. While there will always be comparisons, the fact Charlotte does not have to live under the cloud of her father’s success will allow her to forge her own path in the company. And with the sudden push by Stephanie McMahon, Charlotte, Becky Lynch and Sasha Banks will help create the same kind of excitement that Lita, Trish Stratus and Torrie Wilson added to the Attitude Era. The fact we saw nine female wrestlers with the chutzpah to make a statement in a male-dominant promotion over the better part of the last decade has me a bit excited. Maybe the two biggest losers from last night were two wrestlers who didn’t even get in the ring last night. What is the WWE going to do with Dean Ambrose and what will happen to Cesaro now that he did not get a United States Title opportunity? Since he lost to Seth Rollins at Money in the Bank, Ambrose has been toiling in obscurity and the WWE is allowing him to do it. Ambrose is too talented to not be in a major program – something the company has been blind to see. Here’s hoping in the next five weeks something materializes that will kick the Lunatic Fringe up the WWE ladder. Cesaro looked as good as he has looked since arriving in the WWE in recent weeks. His program and matches with John Cena has shown off just how good a performer he is. And I would dare to say he is pound-for-pound the toughest SOB on the roster. Could a Cesaro/Cena program work for SummerSlam? I sure hope it would. Cesaro is a main event talent who is caught in a numbers game right now.